An owner preparing to request bids or to award a contract for a construction project often requires a means of verifying the background, references, and financial stability of any contractor being considered. These factors, along with the time frame for construction, are important for an owner to investigate. 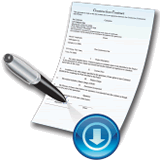 Using the A305™ Contractor's Qualification Statement form, the contractor may provide a sworn, notarized statement and appropriate attachments to elaborate on important aspects of the contractor's qualifications. The AIA® has included warning text at the bottom of their forms indicating that if the warning text isn't red then the form isn't an original. 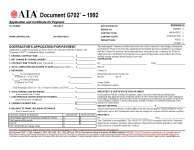 If you use lots of AIA forms, or you can get away with "AIA-Like" forms then please visit this website to see what they have. You use their software to fill in the AIA forms on your computer following the layout that the program gives you; just feed an AIA form into your printer, hit print, and voila! your printer fills in the form with the information you typed into the program with your computer. For an exclusive discount on this program that fills in A305 AIA forms, and other AIA forms use code TCG (stands for TheContractorsGroup) when checking out. faster than overdraft fees can domino in a bank account!